Last week with help from The Compass we set out to gather some feedback from students on the apps they would most recommend to others to aid study at University. Recent statistics reveal that educational apps are the second most downloaded category in Apple’s app store, but what constitutes as an educational app? Often apps that aren’t typically seen as educational can be assistive in University study, so using the speak-board on Penryn campus helped us gain further insight into the apps our students found useful and would recommend to others. Referencing apps were the most recommended of all the apps posted on the board, RefME in particular received praise; the free app syncs to your RefME account and allows you to scan resources using your phone or device to create citations, reference lists and bibliographies. EasyBib was also noted as a good app with the pretty much the same functionality as RefME, however this doesn’t support Harvard referencing. Video based apps were also those featuring high on recommendations, especially those which involved an element of learning; You Tube and Ted Talks were seen as good apps for watching content on the go, SciShow, VSauce, Crash Course were specific You Tube channels which were put forward as being particularly educational and interesting to watch. Khan Academy was also mentioned, this app features a host of educational materials available for free. Needing some music to help with studying? Spotify is a music streaming service which puts millions of tracks at your finger tips. 8tracks was another recommended app which featured on our feedback board, described as the peoples playlister, users are able to create mixtapes of 8 tracks or more to share with the online community. Of all the types of apps posted to help with studying, organisational tools were by far the most recommended. Document organisation tools such as Evernote and Google Drive were suggested, also note taking and list apps: Todolist, Keep Notes (which featured in our recent Tools to Support Research post) and Reminders. There are an abundance of these tools available for phone and tablet, it’s easy to see why they’re popular especially when it comes to University study. HabitRPG came highly recommended from a few individuals, the ‘gamified’ to do list app aims to ‘make habit building fun’ by rewarding points when you complete day-to-day tasks. The University of the West of England also features in our list of recommended apps with SAM, a tool to help understand and manage anxiety. It’s free and allows you to visualise your anxiety profile and connect to with a wider community who use the app. For those wanting to make apps for your device Aris was one tool mentioned last week, one student has used the platform to create a campus tour for fellow classmates, built as user-friendly and open source it has all the resources to get you started. 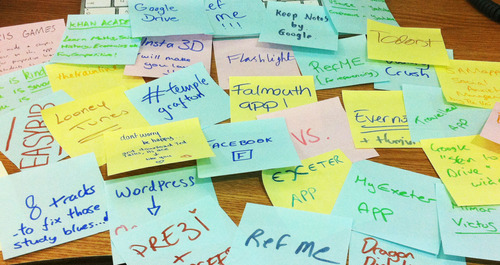 To accompany the feedback received from students we are holding an apps event for staff to come and share tools they find useful as part of their teaching at University (12:00, 11th February, Peter Lanyon, Seminar 7, Penryn Campus).